Once Christians are saved, are they no longer sinners? What does the Bible say about this? I still struggle over my sinful nature every single day. I just can’t break free from the tendency of my heart. It reminds me of the struggle the Apostle Paul had after conversion, where he wrote, “For I have the desire to do what is right, but not the ability to carry it out. For I do not do the good I want, but the evil I do not want is what I keep on doing” (Rom 7:18b-19). Doesn’t that describe you? It does me! I suppose we can take a bit of comfort in knowing that we’re in a struggle, because any old dead fish can float downstream (Eph 2:1), but the ones who struggle with sin are swimming upstream against the culture and their own sinful nature. They (and we) simply must press on and look ahead to the coming kingdom, however, if there is no struggle with sin, there may be no presence of the Spirit, so even though we battle with sin, it’s good to be in the battle, but if there’s no battle, it’s time to examine one’s self to see if they’re in the faith or not. In our little victories over sin, God is pleased, even though we fall infinitely short (Rom 3:23), but that is what sanctification is…a slow growing process of holiness in the person’s life brought about by the Holy Spirit, and why I believe He is called the “Holy Spirit.” He lives to make us holy and more like Christ. Even in Paul’s sin, he understood that “it is no longer I who do it, but sin that dwells within me,” (Rom 7:17), but he does acknowledge that only through Jesus Christ can he possibly be saved (Rom 7:24-25). Paul wasn’t the only wretch on the planet. Martin Luther must have understood the tension between the now and the not yet; the time now when we struggle with sin and the time when we’ll be saved to sin no more, but even after we’re saved, the Bible still says, all have sinned and all are still sinners (1st John 1:8, 10; Rom 3:23), so it’s difficult to reconcile their statement that they’re not sinners with Scripture. Once some people are saved, they believe they are no longer sinners, but that’s really sad, because Jesus came to die for sinners and not the just (which is really zero; Rom 3:10-12, 23). When I pressed one man at our church who said that, I ask him, “So you haven’t told a lie in the 7 years you’ve been saved?” He said, “Well, no, I’ve told a few,” so I said, “See, you’re a liar like the rest of us! ?” He said, he wasn’t a liar, so I asked, “How many lies does it take to be called a liar” (hint; just one!) and how many bank robberies does it take to be called a bank robber? Why else would Paul call himself the chief of sinners after his conversion, and after God had appointed him as the Apostle to the Gentiles, if he still didn’t consider himself one? Why would God appoint a sinner for such an important position? It’s because He can’t find a sinless one! The only Sinless One was Jesus Christ, Who is also God, so God uses sinners like us, even though we have received the righteousness of Christ, but even that is not our own righteousness (2nd Cor 5:21). Our own righteousness isn’t very pleasant to read about (Isaiah 64:6). Not every person I know that says they’re not a sinner is self-righteous. I’m not making sweeping generalizations, but I have had at least two people come up to me and complain about others in our church, and they came across as self-righteous because they looked down on the other church members, who, like the rest of us, are sinners! And what he was talking about was not an essential area of concern. To me, it was not sin, but to them, who believed they “knew no sin,” it was offensive. I tried talking with these men about what Jesus said of those who trusted in their own righteousness, and their self-righteousness made them look down on others, even despising some (Luke 18:9; Rom 10:3). Sadly, they are no longer with us. Why, if we’re no longer sinners, why would the Apostle John tell us that when we have sin, we can confess it to God since “he is faithful and just to forgive us” (1st John 1:9)? If a believer is suddenly no longer a sinner, why are we often told in the Bible to confess our sins (from Exodus to Revelation)? Isn’t repentance and confession of sin an ongoing process after God brings them to Christ (2nd Tim 2:25)? If I tried to live with my wife and tell her, “Well, I’m not a sinner (she’d laugh!) and so I don’t need to ask your forgiveness when I do something that makes you mad because we have a personal relationship with one another.” That won’t sit well at all. John sandwiches the verse about asking for forgiveness between two verses that declare we need it! “If we say we have no sin, we deceive ourselves, and the truth is not in us” (1st John 1:8), and “If we say we have not sinned, we make him a liar, and his word is not in us” (1st John 1:10). I don’t mind admitting to anyone that will listen that I’m a sinner. If I try to deny that, my life will prove me wrong, so I believe it’s best to admit we’re still sinners, yet saved. Still a work in progress but secure in His hands (John 10:27-29). It is sanctification that is at work. God is working in us and through us, but that doesn’t mean we just “let go and let God.” No, Jesus said “Strive to enter through the narrow door. For many, I tell you, will seek to enter and will not be able” (Luke 13:24), and so we must “Enter by the narrow gate. For the gate is wide and the way is easy that leads to destruction, and those who enter by it are many” (Matt 7:13). 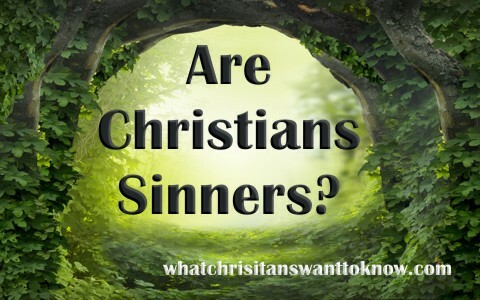 Read more here: Why Are We Born Sinners? I’m not too sure many Christians DO want to know this, but they certainly need to know it. Without an awareness that we still sin we have no need to confess our sin and, therefore, no way to receive God’s mercy. We enter by Jesus’ righteousness and continue in our own. Thank you, Sir, good article. Thank you for the encouraging words Jennifer. Love you pointing out God’s mercy. Previous post: Can A Christian Have A Spell Put On Them? Are Generational Curses Biblical?